Dark Horse has revealed plans to release The Legend of Zelda Encyclopedia Deluxe Edition, a book that will celebrate the more than 30 years that players have spent with the legendary series. Their heartfelt homage even goes as far as to recreate the original gold cartridge as faithfully as possible, coming with a black polypropylene sleeve lined with velvet flocking, and a scale instruction booklet. And then, the cover is a gold foil paper with gloss lamination and a spot gritty varnish, with the details embossed and debossed, gold gilding on the top and foredge, and black gilding on the bottom. Inside, which is important for a book, you will find a comprehensive collection of enemies and items (potions to poes), an expansion of the lore touched upon in Hyrule Historia, concept art, screencaps, maps, main characters and how they relate, languages, and more. There’s even an exclusive interview with The Legend of Zelda series producer Eiji Aonuma. The book is the last of The Goddess Collection trilogy and promises to be a treasure trove of explanations and information about every aspect of The Legend of Zelda universe. 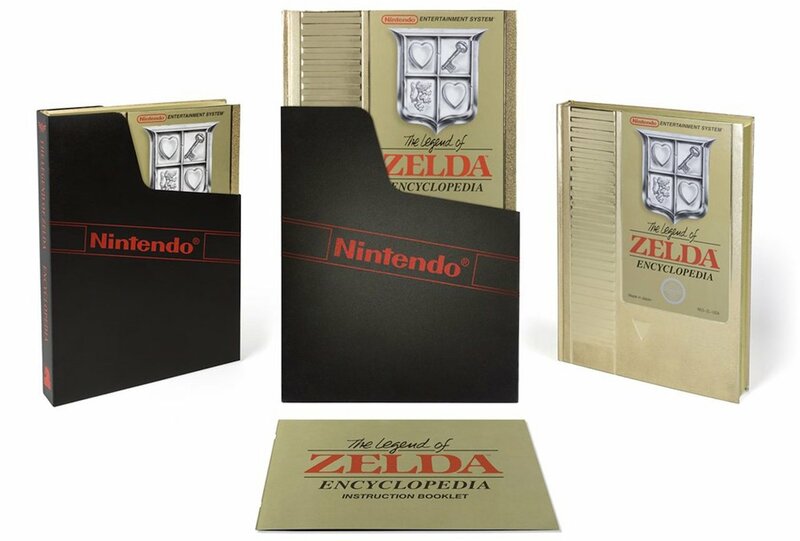 The Legend of Zelda Encyclopedia Deluxe Edition will release in North America on June 19th, priced at $71.99.